Observation - Rosemary Beetle (Chrysolina americana) - UK and Ireland. Description: This dark red beetle with rows of gold dots was spotted on a Rosemary bush. 6 to 8 mm long. 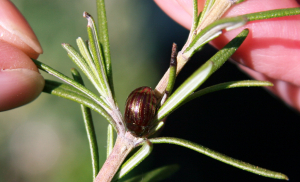 This dark red beetle with rows of gold dots was spotted on a Rosemary bush. 6 to 8 mm long.